LOUISVILLE — The so-called Curse of Apollo is broken. And maybe by a new racing superstar. Justify, the Bob Baffert trainee with just three career starts heading into the Kentucky Derby, powered through the slop to win powerfully by 2 1/2 lengths over Good Magic on a sloppy track at Churchill Downs. Audible finished third. 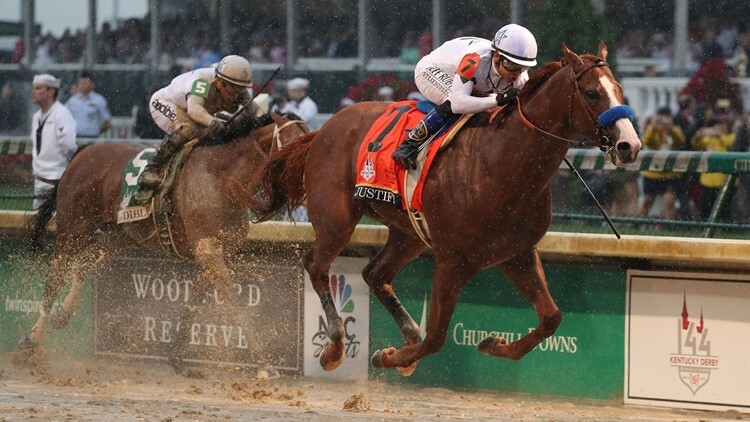 Not only did Justify remain unbeaten at 4-for-4, but he became the first horse since Apollo in 1882 to win the Derby without racing as a 2-year-old. Justify becomes the sixth consecutive favorite to win the Derby. Getting a clean break from the No. 7 post position, Justify pressed a very fast pace through a half-mile in 45.77 seconds. But he had plenty in reserve, taking the lead with a half-mile to go over Promises Fulfilled, then shaking off a rally from Good Magic at the quarter pole. At the end, it was never in doubt. Justify gives Baffert, who also trained 2015 Triple Crown winner American Pharoah, his fifth Kentucky Derby victory. Jockey Mike Smith, at age 52, won his second Derby and first since 2005. Mike Smith aboard Justify (7) beats Javier Castellano aboard Audible (5) to the finish line to win the 144th running of the Kentucky Derby at Churchill Downs. The final time was slow at 2:04.20, but that largely was due to the sloppy track. Throughout the week, the weather forecast offered nary a hint of what was to come Saturday. In fact, all the indicators pointed to Friday’s Kentucky Oaks as more likely to be impacted by rain, with Derby Day lined up to be pleasantly spring-like. Instead, a large storm front parked over Louisville all day long, bringing steady drizzle and periods of hard rain. More than two hours before post time, the amount of rainfall had long surpassed the 2.31 inches recorded back in 1918, making this the wettest Kentucky Derby on record.